If you love sweets, you must like to have Chom Chom. Chomchom is also the most famous sweet in Bangladesh. Now you can order chomchom from online. Order chomchom online and get them directly delivered to your doorstep. Buy chomchom online from the largest online shopping mall in Bangladesh, Ajkerdeal.com. 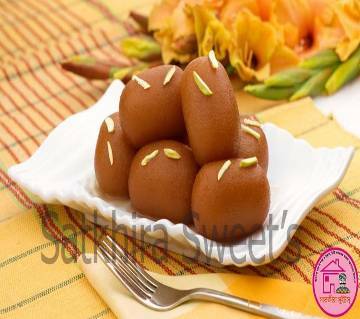 This milk cream based mouth-watering sweet is liked and loved by all. Generally, they come with oval shaped with soft, spongy and delicious flavor. The soft & sweet chomchom, soaked in syrup accompanied with malai brings a true pleasure to your taste buds. They come in a wide variety of shape and size for you to choose from. Sweets can be an extra addition to make any celebration or function special. Celebrate any occasion with your friends and family with chomchom. Find the best quality chomchom at the best price from Ajkerdeal.com. We provide traditional chomchom from the famous city Tangail, Pabna, Netrokona and much more for you to choose from. There is Porabari’schomchomavailable at our site which is famous to all.They are freshly made and no preservatives were added for extra flavor.The taste is so good that you will surely love to have another one. This unique taste sweet can be your first choice for celebrating birthday, wedding, family or corporate events. Click on our site for chomchom from the famous city of Bangladesh. Order your favorite sweets from online. Buy chomchom online from Ajkerdeal.com and enjoy a hassle-free online shopping experience with us.